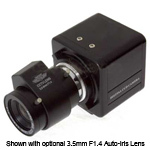 We carry a wide array of digital video cameras for special application use. All of our cameras are 540TVL or better and use the Sony chipset for the best and clearest video. The ideal digital camera for Stealth Operations where even infrared light (IR) could give away your position. The "Pitch Dark" camera shoots great color video in well lit situations - but when the lights go out, that's when it really "shines." The 8004PB shoots clear black & white video in total darkness. An ideal digital camera for exterior mounting on the rear of the vehicle or the side of your house. Waterproof design stands up to harsh outdoor environments. 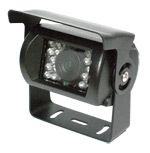 Infrared lighting ensure you see everything - even after dark. This digital camera shoots hi res color images in daylight and very clear black & white at night utilizing the onboard infrared emitters. Tough cast metal housing and strong plastic dome to deter vandalism. 6mm lens with an IR range of 100ft. When you need hi res color video in a small package, the 9168 is the camera you need. Swivel/tilt bracket lets you aim it where you need. Measuring out at only 1 7/16" square and 1 3/16" deep (w/o bracket), this camera can be easily mounted in many small housings. A transit bus favorite. Great small color digital camera where lighting is not an issue - like a lit parking lot. 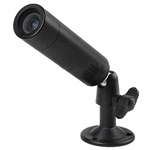 The Bullet Camera can be mounted under eve of house or building. Small metal swivel bracket with thumbscrew makes for easy camera positioning. Great small color digital camera with high sensitivity and low power consumption. High resolution 540 TVL and Digital Luminance Adjustment. Built-in DNR (digital noise reduction). Auto-Iris lens control.